Hopelessly Devoted Bibliophile: Why Write Short Stories? A Guest Post by Richard Salter. Why Write Short Stories? A Guest Post by Richard Salter. If you've followed my blog for any length of time, you'll know that I'm completely obsessed with both Science Fiction and Fantasy. Put a book in my hands that takes me to another world? You have me forever. I'm that much of a nerd. So of course I am ecstatic to welcome today's guest! This is Richard Salter! Contributing author to, and editor of, World's Collider. An anthology filled with death, destruction, and the terrible nightmarish creatures that bring about both. Can I please say that I've been drooling over this book ever since I first set eyes on it? I'll let you decide for yourself though. Sounds amazing, am I right? Lucky for us, Richard was kind enough to grace us with a guest post today, so I'll let him have the floor! Read on to the bottom, he's also brought along a surprise! Ask any writer if there’s money to be made from short stories and they will likely laugh at you. Novels are the way to make a living from your craft. The amount of money I’ve earned from my short story sales has ranged from the cost of a pizza to the cost of an iPod. So why do it? Why not channel your efforts into creating a world, a set of characters and an intriguing premise for the sake of a novel? Why waste good ideas on a much shorter tale that won’t make you much money and likely won’t be read by as many people. Well firstly they can be fun to write. Maybe the idea you’ve had is struggling to stretch to novel length. Maybe your central idea is too cluttered in an attempt to stretch it out. The idea might make an effective short story. It’s a great way to hone your craft. Short stories force writers to get to the point or run out of words, and they allow a single idea to shine without the need for subplots or extraneous characters. Many successful novelists will sometimes crank out a short story, just for a change of pace or to keep creative juices flowing while researching their next novel. For the new writer, short stories are a very effective way to raise your profile and get your work in front of readers. In Solaris Rising, I shared cover space with Steven Baxter and Alastair Reynolds. People who bought the anthology just for them might well have read my story too. If they liked it, they might seek out more of my work. It all helps, and it adds real sales to the resume when approaching agents. Writing effective short stories is not easy and it won’t make your fortune, but it can be lucrative both creatively and in establishing a positive reputation as a writer to watch. 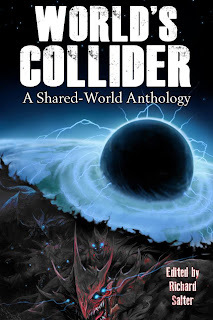 Thanks to Jessica for giving me this space to ramble, and for allowing me to announce that an anthology I edited, World’s Collider, is free to download for two days starting now! This is a unique collection with eighteen original stories by great writers that combine into a unified storyline. This mosaic novel charts a terrible accident at the LHC and the horrors that invade our world in the years that follow. Enjoy! 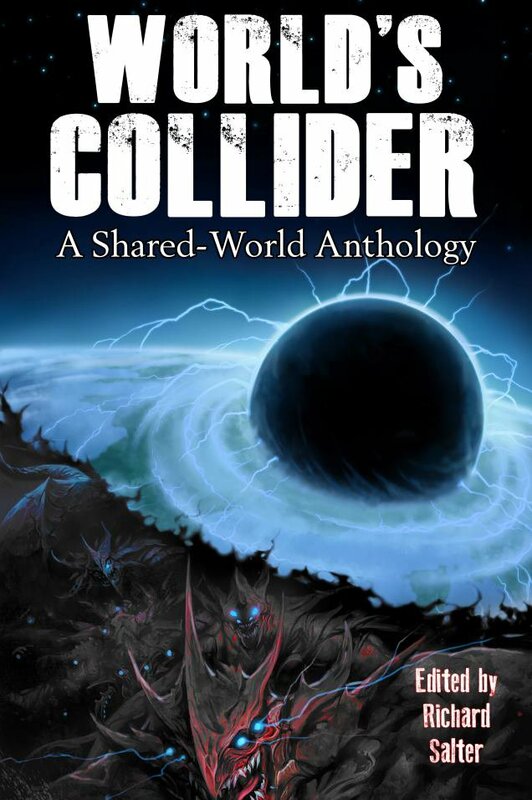 For two days only you can get your own copy of World's Collider absolutely free! Tuesday 11/27 and Wednesday 11/28, Richard Salter is sharing his book with you. So go claim your copy and get reading! The links are below and, as always, don't forget to leave some comment love for our guest.